Consumer finance companies are offering various promotions to customers, aiming to enlarge their share in an increasingly competitive market. FE Credit, currently the country’s largest consumer finance company with a market share of more than 50 percent, is currently offering dozens of promotions, such as purchase via installment for Oppo phones, Daikin air-conditioners with zero percent interest and purchase via installment for Honda and Yamaha motorbikes with an interest rate of only 0.99 percent. FE Credit’s rivals, like Home Credit and HD Saison, also have similar programs to attract customers, especially young people, who have high consumption demand. According to a representative at an electronic appliances center in Hanoi, consumer financial companies, which are his centre’s partners, are implementing more than 20 promotion programs. Consumers can take advantage of this occasion to shop now since there are many promotion campaigns, the representative said, explaining that previously, for the purchase in installments of a phone or an air-conditioner, in addition to the principal, buyers had to pay some fees plus a high interest rate, but now, due to increasing competition, financial firms are scrambling to cut interest rates and launch promotions. Experts attributed the ease in accessing consumer credit to rising competition pressure. If the market had only a few consumer lending companies few years ago, it now has some 20 companies operating in the field, which has a huge potential with annual growth rate of more than 50 percent and projected value of 1 quadrillion VND (US$43.85 billion) by 2019, according to a report from the Ban Viet Securities Company. Several financial companies have also received big investments from foreign sources. FE Credit, for example, has raised more than US$250 million from financial giants such as Credit Suisse, Deustche Bank and Lion Asia. The new investments have helped consumer finance companies gain capital and a more sustainable strategic vision, which have benefited customers with interest rate cuts and promotion programs. Despite the rate cuts and promotion programs, experts warned that ease of access to consumer loans also has certain drawbacks. 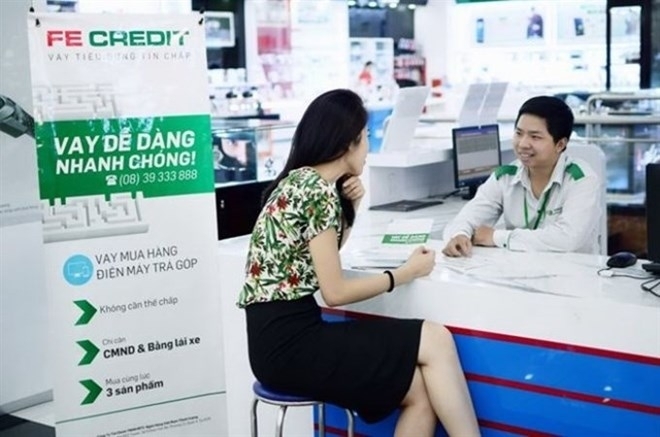 While believing consumer credit would help economic growth in 1-2 more years, Viet Dragon Securities Company (VDSC) has also warned of risks, of which the highest risk is that people may borrow money which goes beyond their payment capability. According to VDSC, after analysing consumers’ behavioural trends, the company realised it had excessive optimism about future income. Financial expert Dinh The Hien advised that consumers need to determine whether loans, in cash or via installment purchases, are really necessary, and if they can afford them. Firms should also clarify what fees will arise, and what penalties apply in case of late payment. Borrowers should not rush to avoid debt defaults, Hien advised, adding that only if all the above questions have been resolved should the consumer finance loan agreement be signed.